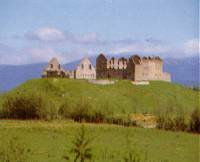 Ruthven Barracks is an infantry barracks erected in 1719 following the Jacobite rising of 1715, with two ranges of quarters and a stable block. The Barracks were captured and burnt by Prince Charles Edward Stuart's army in 1746. 1m from Kingussie. Signposted from the A9 and the A86 in the centre of Kingussie.